Petlife Flectalon Hi Vis Dog Jacket has been constructed to give maximum visibility night and day. The Flectalon Hi Vis Jacket will keep your dog sheltered and warm with the layer of thermal insulation which reflects up to 95% of the heat radiated from your dog back to him/her. 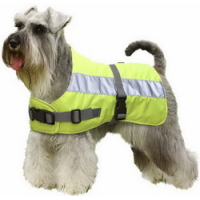 The hi vis features are hugely beneficial to dog and owner and offer personal safety. The Flectalon HI Vis Dog Jacket is water resistant and also machine washable at 40° maximum. Bought this for my 12 year old wiermeraner as I had purcheased one last year for our other wiermeraner. It really keeps their backs warm and dry, keeps cold wind out too. It is easy to clean. Adjusable straps that clip together for a snug fit (better than velcro straps as the dog hair etc does not stick to them making them useless)and a generous length. Bright enough for dog and owner to be safe. Excellent value. Great product and a good price. Really bright, generous fitting and adjustable.If there was a negative it would be that its only 'shower proof' and not fully waterproof.